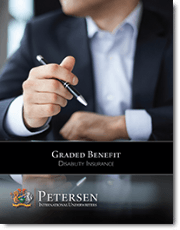 Graded Benefit DI protects personal income at 65%, up to $20,000 per month. Conditions which are graded are covered at a level benefit of either 80%, 65% or 50% of the monthly benefit amount. The definition of disability is specialty own occupation for the full benefit period. The term of insurance is guaranteed for five years and is non-cancelable. Choice of three benefit levels will enable any hard to place case an affordable premium.